Today we will learn how to read digital inputs from a push button switch. A digital input has only two values: 1 and 0. The configuration of the push button switch is same as that of the reset switch except it goes to a different port pin. The status of the switch will be read through RC1 and every time when it is pressed, an LED connected to RC0 will be toggled ON and OFF. You must be familiar with the digital I/O ports of PIC16F688 and their direction settings. If you are not, read Digital I/O Ports in PIC16F688. 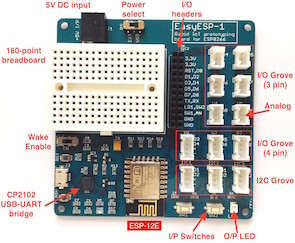 To our last setup (see Lab 1: Flashing an LED), connect a push button switch to RC1 as shown below. 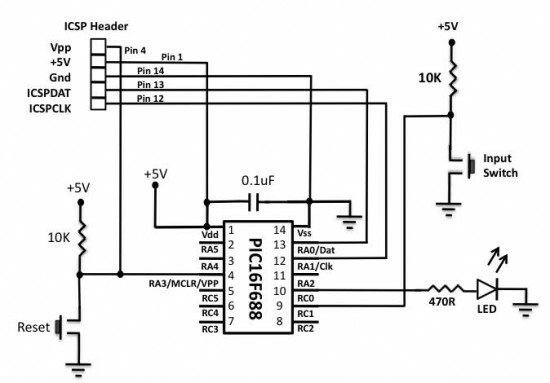 The input ports of a PIC microcontroller have very high input impedance, and therefore, during normal condition when the switch is open, the RC1 pin is pulled ‘High’ through the external 10K resistor. When the switch is pressed, RC1 is pulled to ground and the microcontroller will read it as logic ‘Low’. 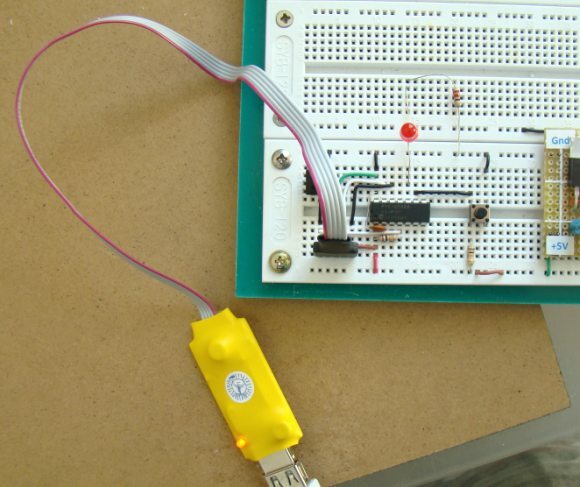 In this way, a simple push button switch with a pull-up resistor can be used to provide digital inputs (1 and 0) to the microcontroller. Circuit for reading digital inputs. You can see that the Button command has debounce features built in. When a mechanical switch (like a push button) is pressed or released to make or break an electrical contact, the switch tends to make multiple transitions between ‘open’ and ‘close’ before coming to the stable final state. This is called switch bounce and this activity may go on for tens of milliseconds. We cannot see this bouncing but a microcontroller is relatively fast as compared to the action of the switch, and is, therefore, able to recognize this as multiple button presses and respond accordingly. 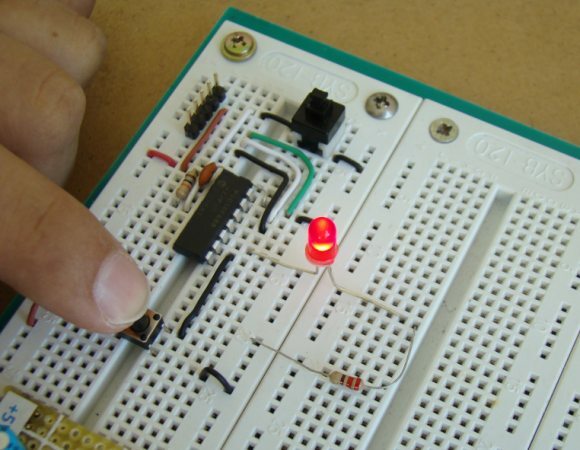 Therefore, the switch must be debounced before it’s status is read by a microcontroller. Debouncing circuits require extra hardware and thus raises the cost of the embedded system. The easiest solution is to implement debouncing in software. The simplest logic is to wait for a few milliseconds (5-20 ms) after the key press or release is detected, and read the final state of the switch again to make sure it is a valid button press or release. Note that the configuration bits setting is same as in Lab 1. Every time the switch is pressed, the LED toggles ON and OFF. Once the switch is pressed, the microcontroller will wait for its release before it detects another press. Could you please help me. I dont know enough about progrmming to write my own. I am using a pic16f877a and want to use MPLAB run the program. light led 1 and 2, push again will led 1+2+3, forth push will put out all leds. I know how to start the program and to program all input and output ports. Only one led must be lit at a time. Than you for a very informative tutorial. I have burned my simple led glowing program of MPLAB IDE v8.83(hightech C compiler ) of PIC 16F877A with Pickit3.And it is showing programming is successfully.But during hardware interfacing the led is not glowing . 1. Board is well connected. What can be the error? If it is oscillator problem,how to check crystal oscillator is damaged or not? hi i like your website.I need to use pic16F887 and what modifications do i have to apply in the code. I kept MCLR disable and 4 MHZ internal oscillator selection from MICRO C project editor and used “IC-Prog” (1.05D)- to download the .HEX file . Can you please help me , where I am doing wrong . 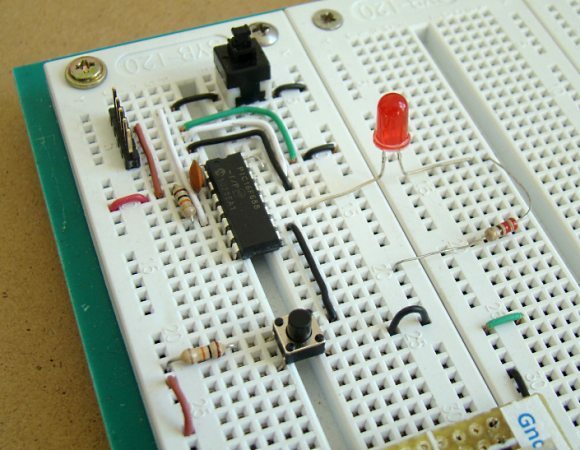 Pingback: Connecting multiple tact switches on a single input pin of a microcontroller » Hallo, here is Pane! in mikroc pro this code give an error as “button” not defined. You need to include the button library in your program. While copying and pasting the source code from website to mikroC editor, I have experienced formatting error a couple of times. So I have uploaded the entire mikroC project files (including source code), which you can download from the link provided in the software section. What type of programmer are you using? I really liked your webiste as it provides not only the schematics but also the real arrangement of components. Simply a neat and clean work. Good job. Would you mind if I send you some of my own schematics and projects. Sure, you can send them to ‘admin at embedded-lab dot com’.